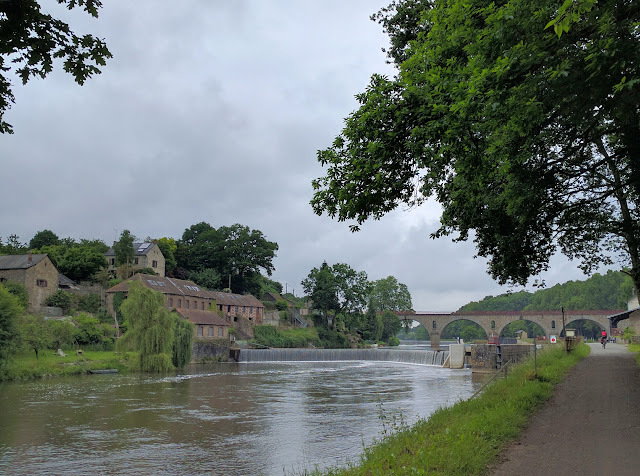 After yesterday's battle with the mud, today we pulled in our horns and chose a more modest destination - Mayenne, the next significant town on our route home. Mayenne is only 40 kms or so away along the river, was never going to take more that a couple of hours to complete, so I had to concede to Christine's suggestion that we actually have a look round Lavel, the town were we stayed last night. To be honest, after our brief visit last year I had concluded that it was a bit of a dump. 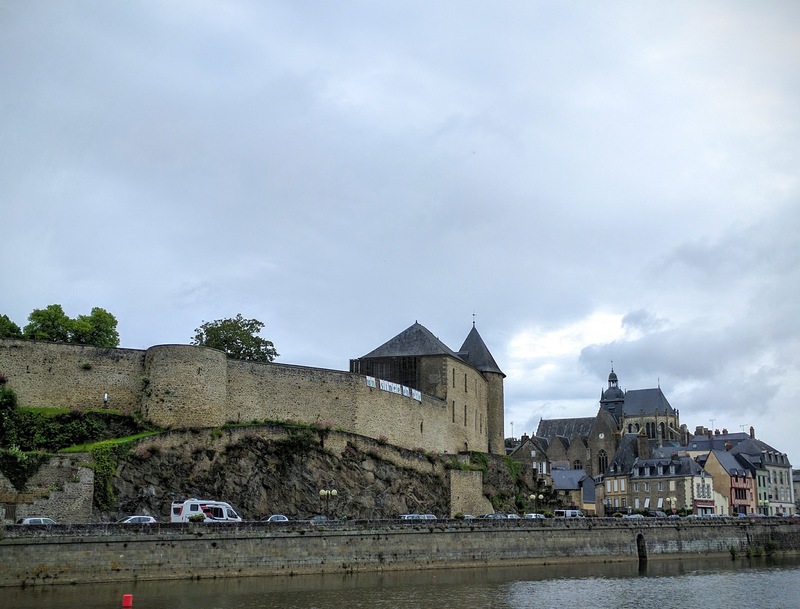 As it turned out first impressions can be completely wrong and hidden behind the slightly run down river frontage, Laval has a stunning medieval town centre. Lots of a half timbered properties, carefully maintained, are being reused as restaurants, bars and artisan shops which, on a day when it wasn't Monday and when the weather was half decent would have been a great place to spend some time (and money, were it not for the painful constraint of one pannier to get stuff back home: still I managed to buy a pair of shoes - ed). The other reason we decided on a short day was the weather, it still hasn't fixed itself. It wasn't actually raining, just grey and chilly, but the forecast was for heavy rain later. 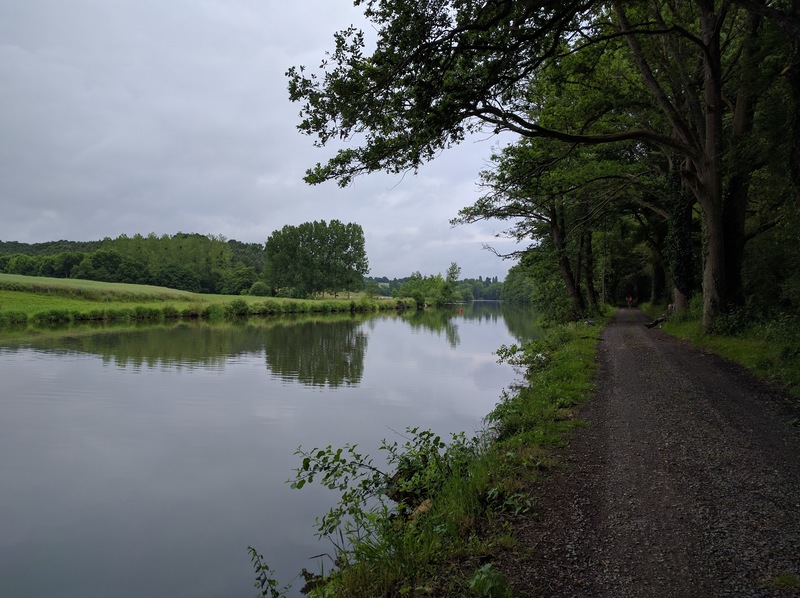 The route along the river from Laval to Mayenne isn't quite as good as the route to Laval. It's more open and the trees aren't quite as pretty. Although there are more locks and it's getting slightly hillier, the huge mills that featured yesterday have largely disappeared. There was one mill I was looking forward to stopping at. 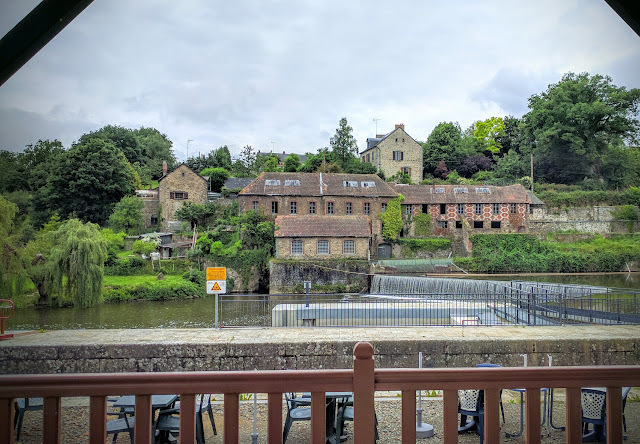 At real beauty spot, about half way to Mayenne, where opposite the half timbered mill was a little cafe. I'd forgotten it was Monday and the cafe was shut. We pressed on to Mayenne, Christine was cold and we decided we would visit the bike shop there (we went there last year) and buy some cycling leggings, they were bound to have some. We got to the hotel, dropped off out bikes went to the shop, closed it's Monday. Actually there's not much to do in Mayenne, it's not as big as Laval, but it does have a big and impressive looking Carolingian castle. We climbed up through the alleys, followed the signs to the museum and of course it was shut, it's Monday. The hotel was comfortable though, the Grand Hotel in the middle (slightly close to a busy main road). The dining room in the evening was nearly full, each table with a single person eating alone, we guessed that they were all there for a assessment centre or something, they didn't look very happy. Feeling smug that we're past such things we both ordered fish. It was dreadful. We had forgotten the golden rule, don't order fish in France on a Monday. Oh the joy of not having to live that life of corporate game playing.